"Voluptuous Worship of Rapture and Response"
The modern era of digital music platforms such as Bandcamp and SoundCloud have opened up the channels of distribution for any musician with access to recording equipment and/or software. One of the side effects of this floodgate opening is the deluge of one-man bedroom and basement projects in all genres of music drowning listeners with choice overload. The honest truth is that most of it is pure garbage, but occasionally a true gem will poke through the fog. REBEL WIZARD is one of those rare gems. Australian musician Bob Nekrasov has been a one-man black metal force for the last decade, releasing caustic, nihilistic blackened bludgeonings well-suited for frequenters of the Nuclear War Now! forums under the performer name NEKRASOV. The last few years though have seen the talented musician display a flair for shred guitar under a side project dubbed REBEL WIZARD, with a prolific output of seven EPs and one full-length record between 2015 and 2018 alone. At first glance, the music released under this moniker still shares production aesthetics with the lo-fi one-man black metal approach. But, after a very short time with each individual release, it becomes apparent that REBEL WIZARD is something much more engaging and engrossing, as Nekrasov makes a play for being the next great guitar hero within the musical chaos. The latest record released under this name is titled "Voluptuous worship of rapture and response". While REBEL WIZARD's album and song titles at first appear to be the efforts of a troll taking the piss out of overly pretentious black metal acts of the past, there are multiple layers of incredibly effortful heavy metal to dive into once the play button is pressed. Acoustic intro track "Persisting as it does"—yes, the lower-case lettering of every word after the first is intentional—lures listeners into a false sense of security, with its melodies reminiscent of Zakk Wylde's acoustic work on OZZY OSBOURNE's 1990 classic "No More Tears". When the first proper track of the record — "The prophecy came and it was soaked with the common fools forboding" — begins, a wild musical ride ensues for the next forty-six minutes. The second track is the song where a first-time listener will decide if REBEL WIZARD is for them. The opening riffs start off as something out of the late-'90s Swedish melodic death metal playbook, before launching into a blazing barrage of scorching shred guitar. Nekrasov's vocals hit blood-curdling shrieking registers, all of it distorted through the one-man black metal production aesthetic. 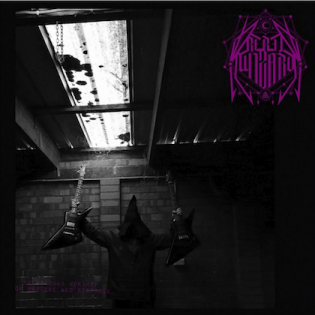 But, at every moment where it appears that Nekrasov has settled into an abrasive black metal groove, the guitars pivot into an almost neoclassical display of aural pyrotechnics that would have even experienced tablature transcribers struggling to keep up. The combination of these seemingly dissonant leanings results in one of the most purely "metal" releases of the year. The guitar work that is more evocative of the Swedish melodic death metal scene continues to enhance tracks such as "High mastery of the woeful arts" and the title track, while buffered by a storm of black metal fury. "The poor and ridiculous alchemy of Christ and Lucifer and us all" starts off sounding like a hyper-charged amphetamine-fueled takeoff of BLACK SABBATH's "Paranoid" before Nekrasov's guitar blaze erupts in a volcanic torrent. Album closer "Exhaustive glory" is appropriately titled. The balance of records released under the REBEL WIZARD name sounds like the output of a musician with a million ideas floating through his head, and he can't decide if he wants to put out a terrifying black metal release, or an album where he just shreds and rocks out: at the end of the day he does both at the same time. Luckily for listeners, Nekrasov is capable of pulling off both of those ends of that ambition.